Portal Zine - Bad weather is happening in the ocean causes the price of fish in a number of traditional markets in Kediri, East Java has increased. Marine fish collectors from three coastal areas in East Java, Tuban, Tulungagung and (Terri) claimed fish stocks are limited, while demand from buyers is increasing. The price of fish in the traditional market town of Kediri forced Setono Betek this new year continues to increase. The increase in the price of fish is caused by bad weather at sea is causing many fishermen did not dare to go to sea. One marine fish collectors of Tuban admitted marine fish stocks is reduced by 30 percent because many fishermen who do not dare to go to sea. "Currently in the high sea waves and rainfall is high. On the other hand the demand of buyers in the market is increasing. As a result the price of fish has increased," said Maman fish collectors from Tuban. 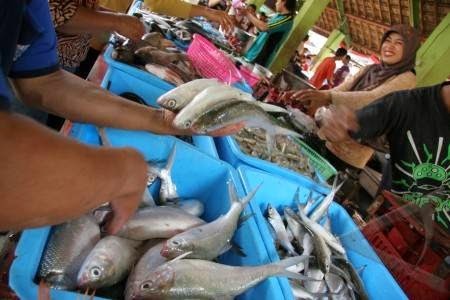 The increase in the price of fish is between Rp 2,000 to Rp 5,000 per kilogram. Price tuna previously only Rp 16,000 per kilogram now increased to USD 18.0000 per kilogram. Tuna Rp 22,000 per kg today to Rp 25,000 per kilogram. "Small squid only Rp 25,000 per kilogram now Rp 30,000 per kilogram and shrimp from Rp 60 thousand per kilogram now Rp 65 thousand dollars per kilogram," said Jumali Setono Market fish merchant Betek Kediri. The increase in the price of fish is not followed by a freshwater fish that is relatively stable due to the supply of fish from ponds under normal conditions. Collectors and traders predict the price of fish will soon be normal over the sea change in the weather gradually improved.